On March 14, 2018, an episode of Law & Order SVU aired which featured a story about a child’s organs being recovered without the consent of her parents. While this episode was not based on a true story, the message it portrays is damaging to the public’s trust around organ transplantation and donation. In the show, a child is involved in a fatal accident. At the hospital, a surgeon recovers the organs from the child without obtaining the parents’ consent. After the parents discovered that their child’s organs were removed, they refused to consent to donation. The surgeon was prosecuted, and while on trial, she revealed that her own child died while on the waiting list. The surgeon believed that the United States should operate under a presumed consent (an opt-out donation system used in Spain and other countries), and decided on her own that the organs should be donated. 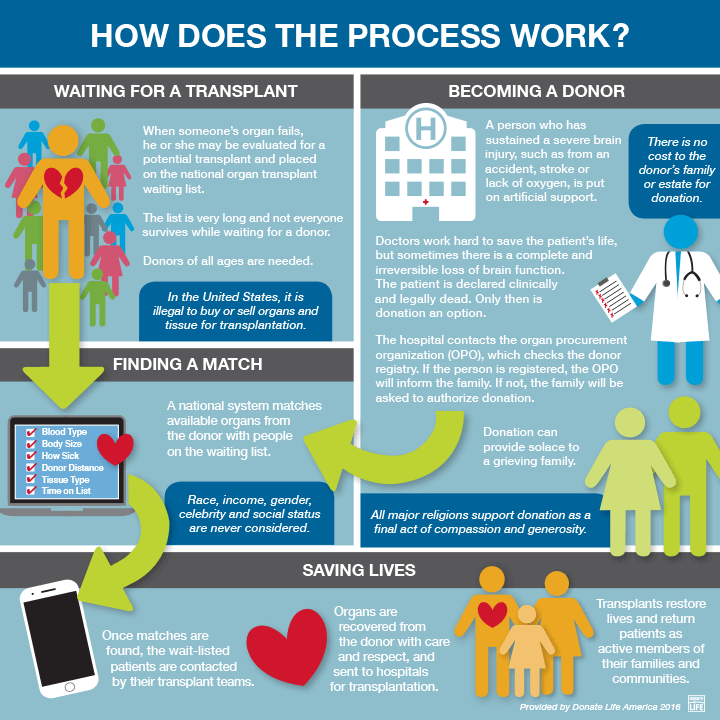 Organs are not recovered from a body without the personal authorization from the donor through the organ donor registry or authorization from the donor’s next of kin. Furthermore, deceased organ donation is only considered after all efforts to save a patient’s life have been performed. It is important that the public is aware of these facts, and is not misled by media sources, which are intended for entertainment purposes only. For more information, we encourage you to visit Donate Life America’s Deceased Donation page. As a seasoned healthcare professional, I was extremely disturbed by this episode of Law & Order because it demonizes the entire process of organ donation. The surgeon portrayed was depicted as an emotionless, haughty zealot who ghoulishly removes the organs of children without parental consent. I am not sure what the writer’s intentions were, but this program will do nothing but damage the already tenuous reputation that organ donation faces. There are so many incredible people who dedicate their lives to helping patients in need of new organs, so why not portray them as the true heroes that they are? Shame on Law & Order, and shame on those viewers who believe that anyone associated with this field is anything other than caring, compassionate, ethical professionals.